I am currently working with my family. It is a small (but not too small) university in Indonesia and I work in the management and as a junior finance lecturer. At first, I chose Monash because of its ranking and most of my friends who studied in Malaysia aimed to study in Monash University too. After studying here, I can say that I do not regret choosing Monash. I joined some clubs during my Bachelor and Master degrees. I joined the Badminton club, Yoga club, Finance club, MUVP, and Leo club. I also attended some talks held in Monash such as the entrepreneurship talk by Jeffrey Cheah. One memorable experience that I will not forget is the study tour that I joined during my summer break in MIB. I got the opportunity to visit companies and universities in China and South Korea. Honestly, I changed a lot after studying in Monash. I used to be quite shy. I never had the confidence to talk to people I just met. In Monash, we were “forced” to talk in the class. The lecturers demanded participation and we had to showcase our presentations. I built my confidence and learned to speak in front of the public properly. Additionally, I developed my communication and teamwork skills. 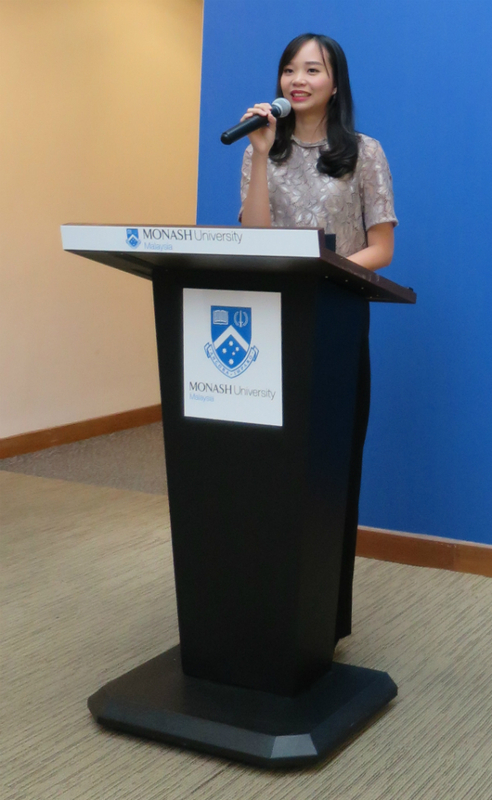 Monash University Malaysia is highly diverse whereby the students come from various countries; from Asian countries like China and Japan, to African and Western countries. It somehow opened my eyes and changed my perspective on the perceptions and stereotypes that the people around me had about certain cultures. I enjoyed this diversity which has made me more tolerant and open minded. Moreover, this diversity is very relevant to my study in MIB. Another skill that I obtained is time management. This is because Monash is very strict in almost everything; from assignment deadlines and plagiarism to exams rules. We were also expected to do a lot of independent learning. It was quite hard to keep the balance between my study and social life. However, I managed to get through everything well and I am grateful for that. It is true that “what doesn’t kill you makes you stronger”. The facilities to support us were good, especially the library resources. The clubs and societies were very active and became a good way for me to relieve my stress. If you moved to come study at Monash, where did you live? How did you find that experience? I stayed at Lagoon View Apartment, only 10 to 15 minutes walking distance from the campus. I enjoyed it since the place was full of students and safe. The canopy walk has made our lives as students much easier. Outside work or study were you able to build on your interest i.e. volunteering, mentoring other students, other educational pursuit )? Yes, I did join volunteer club in Monash such as MUVP and Leo club. I also participated in a Buddhist community outside Monash. They arranged a lot of volunteer program too. I went for trees planting, visited an animal shelter (SPCA), visitation to home for down syndrome and the orphanage, and distributing meals for homeless people (Pertiwi Soup Kitchen). It was a great experience as I could make myself useful. Though at times we would get dirty and tired, I was always happy and satisfied with participating in the community services. Yes, they did. I realised that sometimes we need to get out of our comfort zone to develop ourselves. If I did not go through all these experiences, I might not have enough confidence and courage to challenge myself more in my career. My dream is to be a successful entrepreneur. I noticed smaller companies having bigger passions and ambitions. They are quick and flexible in doing things compared to bigger companies. That was one of the reasons for me to choose smaller companies to start with. Study is the main part, but do make time for your social life. There are many life lessons that you can get from the society. Invest yourself in skills that you will need in the future such as participating in clubs or going to seminars. You will regret more for the things you did not do rather than the things that you have done.